Families listen to the president’s speech on immigration in Portland. On Nov. 20, the Obama administration announced it will take initial steps to reform the nation’s immigration system. By beefing up border enforcement, expanding a program that delays deportation for some and streamlining the legal immigration system, the president aims to lay a framework for Congress to enact long-term reform. 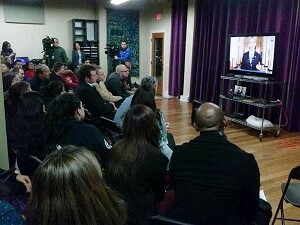 Immigrants and their supporters in Portland, Salem, Eugene and Bend gathered to listen to the president’s speech. Reaction was mixed. Andrea Miller, executive director of Causa in Oregon, says the lives of millions of people will change for the better. “The President's action will help people who have deep ties in our communities with children and spouses who are U.S. citizens or legal permanent residents, but live in constant fear of being separated from their families by deportation,” Miller said. But she added that millions of others are still being left out of the process. Pedro Sosa, director of migrant rights at the American Friends Service Committee in Portland, welcomed the provisions for parents, but expressed disappointment that the new initiative also will boost border security. Some critics decry the plan as an amnesty that is a reach beyond presidential powers. Sen. Mitch McConnell, the Kentucky Republican who will become Senate majority leader next year, promised congressional action in defiance of the president’s reforms. The new Deferred Action for Parents program seeks to keep families together. To qualify for three years of deportation relief, parents must have a child with either U.S. Citizenship or Lawful Permanent Resident status and must have continually lived in the U.S. since Jan. 1, 2010. They also must have a clean criminal record. The president also has increased the age limit for youths who will get deportation relief. The changes don’t provide a pathway to citizenship, something the U.S. Catholic bishops have called for in their immigration proposals. Bishop Eusebio Elizondo, auxiliary bishop of Seattle and chairman of the U.S. Conference of Catholic Bishops Committee on Migration, said the Obama proposals are a good first step. Archbishop Joseph Kurtz, archbishop of Louisville, Ken., and president of the USCCB, citing Pope Francis, saying immigrants are brothers and sisters to be welcomed, respected, and loved. “There is an urgent pastoral need for a more humane view of immigrants and a legal process that respects each person’s dignity, protects human rights, and upholds the rule of law,” Archbishop Kurtz said. Ecumenical Ministries of Oregon welcomed the president’s announcement, but called for more.